First up is my hello spring card. This was fun. 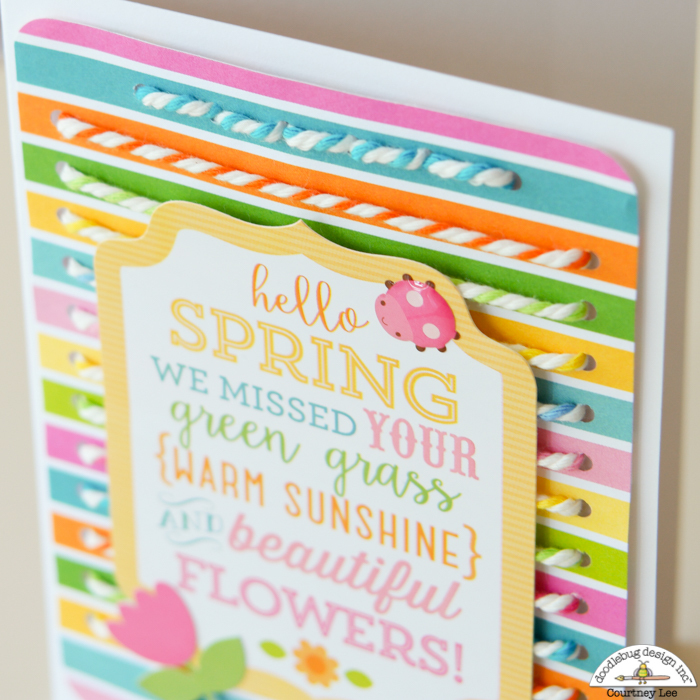 I grabbed this fun patterned paper from the Spring Garden 6x6 paper pad and went to work! I punched holes basically everywhere and coordinated the chunky twine with the stripe colors. This was my first attempt at hand stitching or back-stitching on a card and I think I am in love! 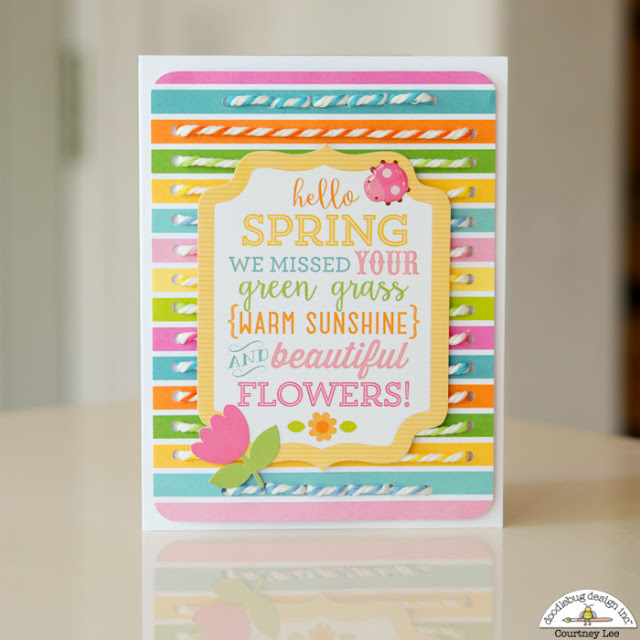 I finished it off with a sentiment from the This and That portion of the Spring Garden collection, a tulip from the Icon sticker sheet and an enamel ladybug. Done. My thank you card was the first one I envisioned. I have a love for all crafty rainbows and wanted the twine to really be the centerpiece. I thought about birds on a wire and added the little enamel chick (I mean, HELLO cuteness!!!) and the blue bird (my personal favorite. I bought a whole roll of those blue birds. I love them. Seriously.) I finished it off with a sentiment and some enamel hearts! Last up is my ladybug card. These were so much fun to make! I saw the idea to make them on pinterest and added my own twist. I have been dying to use this polaroid frame paper and this was just the ticket. Then I just matched the butterflies to the background paper. The sentiment came from the border strip paper on the 6x6 paper pad as did the scrap papers behind the polaroid frames. Some matte enamel dots completed this look! The butterflies were made by wrapping the twine around two of my fingers 7 times. Then I slid it off maintaining the shape. I wrapped the black and white piece around it and secured with a knot at the top and then I shaped the butterflies. The trick here is to use enough of your adhesive to keep the butterflies shape. I really wanted the "down" part of the wings as well as the spread of them to make them look more realistic. I used a clear dry glue so I could just press them down into it. Check out my chunky twine trio again! Thanks for stopping by! What a lovely set of cards! Since I'm a card maker, I really like that you showed 3 unique ways to use the chunky twine on cards. Those butterflies in the polaroid frames are so sweet! 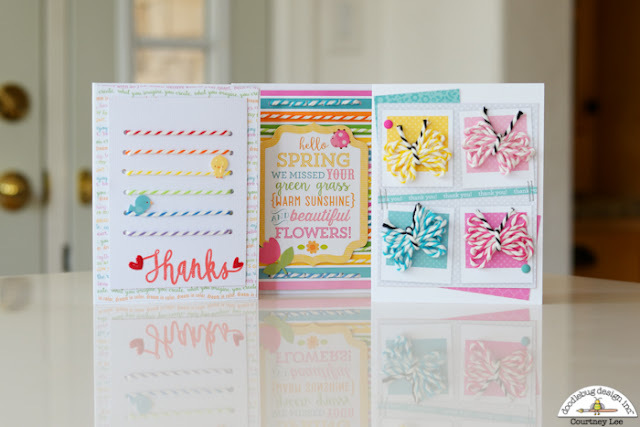 I just love how you can mix and match so many different Doodlebug items because everything coordinates so well. Thanks for the inspiration! OMG You sure created 3 beautiful card and shared 3 totally unique ways to use the twine and the colors are so pretty. Loving the butterflies they are so cute. You sure are one super clever gal and did 3 Spectacular outstanding Creative jobs!! YOU so ROCK!! Such fabulous cards Courtney! Love those butterflies! The three cards are great. The butterflies are beautiful. These cards are so adorable!!!!! 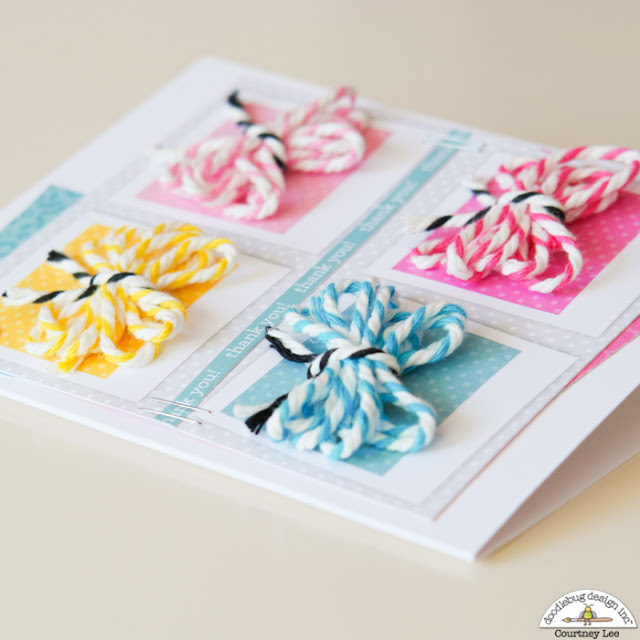 Super impressive and so fun to see the way she used the chunky twine on these three amazing cards!! 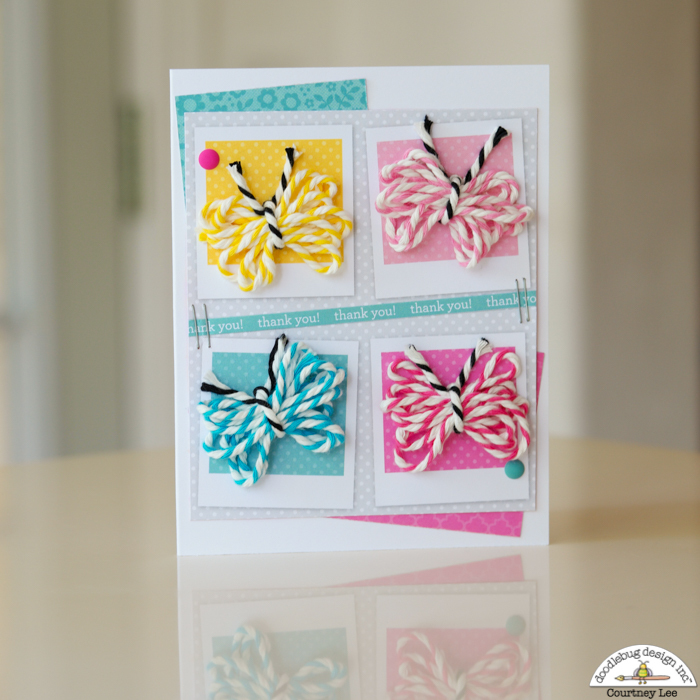 Love the charming and sweet butterflies and I think Courtney is very clever! !